When “Disney’s Newsies: The Broadway Musical!” screened in movie theatres in February as a three-day event cinema offering, there was a good chance it would be a financial success for all involved; Disney Theatrical Productions, which produced all aspects of the project, Fathom Events which acted as the distributor, and ultimately exhibitors, who could use the popular Broadway show to boost midweek admissions, increasing both box office and concession revenue. Sure enough, the event cinema release of “Newsies” in North America was seen by over 210,000 people during its three screenings in upwards of 780 locations, February 16th, 18th and 22nd. It earned USD $3.47 in cumulative box office, making it the second highest grossing title Fathom Events has ever handled. “Newsies” was so successful in cinemas that an additional encore screening has been added for March 4th, 2017. Such a profitable outcome was not a guarantee however, and it took the coordinated efforts of Disney, Fathom and multiple cinema operators to pull it off. Based on a 1992 Disney film, the Broadway production of “Newsies” opened in March of 2012 to rave reviews and played for over 1,000 performances before closing in August of 2014. Two months later, a national tour of the production kicked off and ran for two years in 65 cities. Along the way the musical picked up a devoted fan base, one which was crucial to the success of “Newsies” as an event cinema release. The idea to shoot one of Disney’s theatrical productions for release in movie theatres stemmed, in part, from ongoing conversations between Fathom Events and Disney. “I think that if you knock gently on the door enough times it will open at the right time,” said John Rubey, Fathom’s CEO of the lengthy discussions. “Fathoms interest was in the Disney brand and the Disney Broadway titles.” In February of 2016 Disney Theatrical Productions finally decided the timing was right to bring one of their musicals to movie theatres and settled on “Newsies” as the title to produce. Production began in September of 2016, as “Newsies” played out its run at the historic Pantages Theatre in Hollywood. 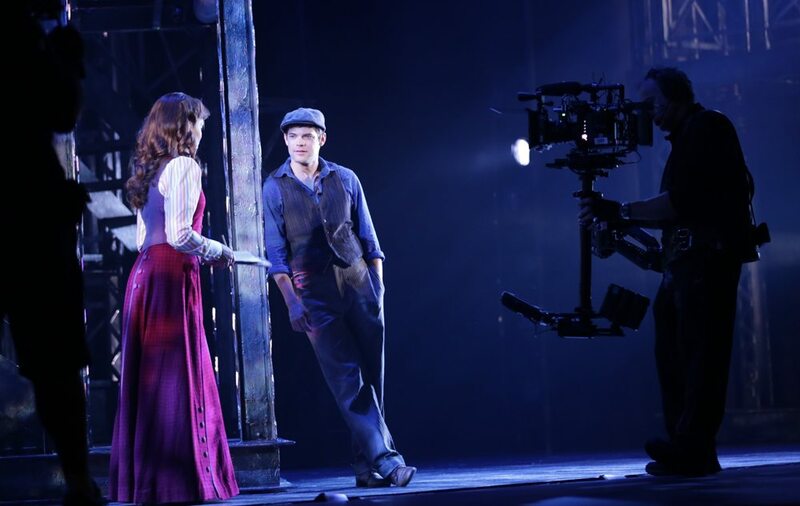 A cast of over 40 actors, actresses and dancers took part in a multi-camera shoot; among them were some of the original Broadway cast members, such as Jeremy Jordan, who helped make the show such a hit. Even before production wrapped, Fathom began working with Disney on implementing a four month marketing campaign and distribution strategy for the eventual release of “Newsies” in cinemas. Woglom’s marketing team collaborated with Disney’s theatrical marketing group, while Kyle Villella, Fathom’s Vice President of Distribution, conferred with the studio’s theatrical distribution team. During what Woglom described as a heavy social media campaign, Fathom monitored all of their digital efforts week-to-week to analyze which medium was driving the most traffic and ticket sales. “We saw that we were getting huge results from the social campaign that was running. So, that was where we focused a lot of our efforts,” she stated. It also helped that Disney provided a lot of marketing material to work with in the way of content, such as clips, stills and other creative. Fathom used these assets for turn-key marketing campaign creative which exhibitors used to help promote their three nights of “Newsies” screenings. “In this case we had so much content that we were able to continue feeding our exhibitors with different types of content, so that really kept the message going on the exhibitors level,” Woglom said in referring to the content strategy used for the release. Marketing efforts extended to offline platforms as well, with Disney and Fathom hitting local performing arts centers, coffee shops, universities and even libraries in key markets. In specific cities, ticket giveaways were conducted on local radio stations to drive awareness. At the same time, Jordan and other members of the cast were conducting interviews for national PR placement across numerous publications and broadcast outlets. It is thanks to all these efforts that audiences turned up for one of the three screenings in large numbers. In fact, on two of the three days “Newsies” was shown it had the highest per screen gross of any title playing in a commercial cinema, despite having only a single showtime. And while Rubey stressed Disney’s primary motivation was producing “Newsies” for an event cinema release, he understands the studio might very well distribute the production in ancillary markets such as home video or premium cable. There are currently no plans for such a release. Nor are there any plans to shoot and distribute other Disney theatrical shows through event cinema releases, though not for lack of any desire on Fathom’s part. “We’re interested in whatever they’re interested in,” was Rubey’s tactful response when asked which of Disney’s other musicals he would like to bring to movie theatres.